We started Paleovalley to make improving your health and nourishing your body with nutrient-rich superfoods simple and hassle-free. Right now we're offering over 20% off our Essential C Complex. Right now we're offering over 20% off our Essential C Complex. 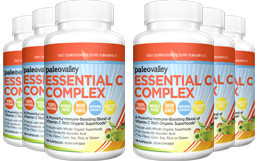 We created Paleovalley Essential C Complex to make supporting your immune system with a full spectrum of organic superfoods rich in vitamin C and loaded with antioxidants faster and easier. Our Essential C Complex is the most powerful, 100% natural, vitamin C product on the planet. It contains not one but three of the most concentrated natural sources of vitamin C: amla berry, camu camu berry, and unripe acerola cherry. Each nutrient-packed serving delivers 750% of your daily recommended intake of vitamin C – an amount meant to help you thrive, not just survive. Most other vitamin C supplements are derived from GMO corn and only contain one fraction of the vitamin – ascorbic acid. Our Essential C Complex contains the entire spectrum with absolutely no synthetic vitamin C... just organic superfoods! 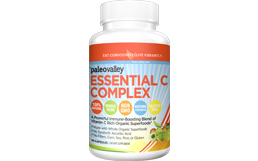 Our Essential C Complex is the most powerful, 100% natural, vitamin C product on the planet. It contains not one but three of the most concentrated natural known sources of vitamin C: amla berry, camu camu berry, and unripe acerola cherry. Each nutrient-packed serving delivers 750% your RDI of vitamin C – an amount meant to help you thrive, not just survive. Our wildcrafted, organic, unripe acerola cherry is the most potent source of natural vitamin C on earth. The vitamin C content of one acerola cherry is 120 times higher than that found in an orange. Grown in the native rainforest of Peru, our vitamin C rich camu camu helps to support a healthy immune system, gums, eyes and skin. It has also been shown to have powerful mood-boosting properties. Amla fruit has been used for thousands of years in Ayurvedic herbal medicine to support heart and brain health through its ability to support circulation and detoxification. Grown in the native rainforest of Peru, our vitamin C rich Camu Camu helps to support a healthy immune system response, support healthy gums, eyes and skin. It has also been shown to have powerful mood-boosting properties. Amla fruit has been used for thousands of years in Ayurvedic herbal medicine to support a healthy heart and brain through its ability to support healthy circulation and a healthy detoxification response. Humans are the only mammals that don’t make their own vitamin C. This means we must get it from our diets. More than just a boost to the immune system, it plays a critical role in many of the body’s functions and is a powerful antioxidant. It also aids in tissue regeneration, the absorption of iron, and production of collagen. Vitamin C has also been shown to fight oxidative stress and cancer, support oral and brain health, manage stress, increase nutrient availability, improve energy levels, combat weight gain, and reduce risk of a stroke, toxic burden, hypertension, and so much more. Most vitamin C supplements are nothing more than ascorbic acid (one fraction of the vitamin C compound) derived from GMO corn and highly processed in a lab. We believe nature knows best and vitamin C is far better absorbed in our bodies when taken in whole food form. This means it is accompanied by the full spectrum of nutrients, minerals, and bioflavonoids that make vitamin C such a powerful nutrient. Our Essential C Complex contains the most concentrated sources of natural, organic vitamin C on the planet with unripe acerola cherry leading the pack followed by camu camu and amla berry. Our acerola cherries are organically grown in the rainforest of Brazil and picked before they ripen which is when the vitamin C content begins to degrade. As a result, one unripe acerola cherry is 120x more powerful than an orange. Humans are the only mammals that don’t make their own vitamin C. This means that we must get it from our diets. More than just a boost to the immune system, it plays a critical role in many of the body’s functions and is a powerful antioxidant. It also aids in tissue regeneration, the absorption of iron, and production of collagen. Vitamin C has also been shown to fight oxidative stress, support brain health, fight cancer, reduce hypertension, manage stress, increase nutrient availability, reduce toxic burden, reduce your risk of a stroke, combat weight gain, reduce fatigue, support oral health, and so much more. We believe nature knows best and vitamin C is far better absorbed in our bodies when taken in whole food form. This means it is accompanied by the full spectrum of nutrient, minerals, and bioflavonoids that make vitamin C such a powerful nutrient. 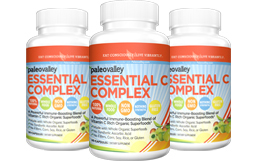 We created Paleovalley Essential C Complex to be the most powerful, completely natural and organic source of vitamin C on the planet. In each serving you will get 750% of the RDI of vitamin C.
With our Essential C Complex you will be getting a full spectrum vitamin C – not the isolated, synthetic form found in other products. It is made with not one but three whole, organic superfoods that are not only incredibly rich in vitamin C but also loaded with other nutrients and antioxidants. Since vitamin C is a fragile nutrient, we use gentle, low temperature methods to dry each superfood. Third party tests have revealed that our Essential C Complex contains 450mg of vitamin C per serving. This makes our Essential C Complex gram-for-gram the most concentrated source of vitamin C of any natural product on the market. Given the incredible, well-studied health benefits of vitamin C, plus the fact that we use the most concentrated organic sources containing their full spectrum of nutrients, our Essential C Complex is the most powerful natural vitamin C product in the world. Each bottle is a 30 day supply and we recommend taking advantage of our bulk discount pricing so you can save more today. Since human beings are the only mammals whose bodies do not make vitamin C, it is vitally important to get adequate amounts from your diet – not just when you feel sick. This is a dietary supplememt that can be taken year-round for overall health and immune support. Also, when you order 3 bottles or more you will receive FREE shipping and handling. What are the ingredients used in Essential C Complex? Simply take 2 capsules with water. Easy as that! Since this is a whole food product containing nothing synthetic you can take more or less if you prefer. What makes Essential C Complex better than other similar products? First off, there are very few similar products. Most vitamin C products are nothing more than ascorbic acid derived from GMO corn. There are several "natural vitamin C" products on the market but we believe ours is better for three main reasons. 1. Essential C Complex contains 100% organic ingredients while many others only contain conventional or non-GMO ingredients. Our ingredients are wildcrafted, organic, non-GMO, and free from pesticides and herbicides. 2. Essential C Complex is primarily made up of the most powerful whole food vitamin C source on the planet: unripe acerola cherry. As acerola cherries ripen their vitamin C content degrades. However, our acerola cherries are picked when they are still unripe when the vitamin C content is at its peak. They are then gently freeze-dried to preserve the vitamin C content. Essential C Complex contains 450mg of full spectrum vitamin C - not synthetic ascorbic acid. This equates to 750% of your RDI. 3. Essential C Complex is gently dried while most other products are processed at high temperatures which can denature vitamin C. Vitamin C is a fragile nutrient and can be damaged by heat so we use low temperature drying techniques and the result is the most concentrated natural vitamin C supplement on the planet. While Essential C Complex doesn't make any claims that you will live to 400 years old and never get sick again, it was created to "work". This is a product that contains real, whole food ingredients. It contains a high concentration of vitamin C from whole foods as found in its natural state where it is accompanied by other valuable nutrients and antioxidants. future orders of our Essential C Complex!